I remember a summer day back in 1970, going into a shop in the Byward Market (Lowertown Ottawa) and telling the shopkeeper, “I want the meanest cowboy boots in the store and I don’t care about the cost.” The proprietor, after a few moments, handed me a box containing a pair of black ‘Boulet’ boots, with four chiefs’ heads stitched into their sides. I counted out my cash and the boots were mine. They became my pride and joy. “Gonna walk in style,” said I, every time I pulled them on. I was a hard living, hard drinking, hard hitting, risk taking son-of-a-gun who didn’t give a damn back then. “Albert Dumont could kick the eye teeth out of a snake at 20 ft. with those boots of his,” my friends would tell fellas who came to town looking for a rumble. I was pretty handy with them all right. A guy pulled a knife on me at a party one time, but as quick as he produced it, my boot came up in a flash, caught him square in the knife holding hand and sent the blade into the ceiling, just like in the movies. What a riot! I wasn’t living a healthy lifestyle. I cared more for alcohol than I did about the love of my parents and siblings. What a loser I was, threw away my hard earned money in rough and ready bars and taverns every weekend. 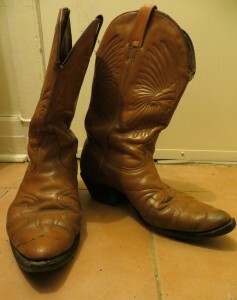 After a period of time, holes the size of silver dollars wore themselves through the bottoms of my Boulet boots. Taking them to the cobbler for repair was the last thing on my mind; I needed the money for booze, don’t you know. Eventually the boots became so worn that I had to either repair them or give them up. I selected to repair them with new soles and heels, once again, I was good to go, returning to the bad life of over-drinking, nonsense and outright debauchery. And on it went until my sobriety began almost 25 years ago. The Boulet boots had been repaired more than a few times by then, and like the sins of my past were pushed aside to gather dust. The sober man I became didn’t care to wear them. Then one day a friend named Herman Standing Ready was visiting at my humble abode. “Nice boots,” he said after he spied them in the corner, “why is it that I never see you wearing them?” I explained to him that they had once belonged to a lost soul who no longer felt an attraction to them. “I’ll do a bit of work on them and bring ‘em back to you if that’s OK.” I told Herman to go for it. A couple of weeks later Herman was back and man, what a job he did on the boots! He changed the colour and added decorations. The boots were a tan colour now with golden clasps on the heals and shiny clips were embedded with nails into the toes. Snakes with eye teeth would have trembled to see them. The year was 1990. So new life was breathed into the boots by an old Sioux warrior and I began to wear the Boulets again. I still have the boots and occasionally I take a cloth and rub months of dust off them and wear ‘em to a place I am expected to speak on addiction. I describe to my audience how I, like the boots, have changed over the years. Neither the soles of my boots nor the soul attached to my body were doing very well at that bad period of my life. The boots were truly in character with the wild man I was in the 70’s and into most of the 80’s. But then the boots got a make-over, as I did too with sobriety. Never give up on a son or daughter, or on any man or woman who has been overtaken by an addiction. They can change just as surely as I did. Until they do, pray hard for them, and keep faith that healing will come to pass for them. I care. And so does anyone else who ever fought alcohol addiction and kicked out its eye teeth. This entry was posted in Sobriety and tagged addiction, Albert Dumont, alcohol, alcoholism, Boulet Boots, cowboy boots, healing, sobriety. Bookmark the permalink. Interesting story. I am glad you are sharing it with others…A person should never stop hoping, believing and trusting.. I never stop hoping, trusting since 71 years ! I love life so much and trust all my relations.